Black Friday, my mom and I were one of those crazy people who were at Walmart at midnight. I returned home with a Cricut....love, love love it! I've found so many ways to use it in my classroom. I decided to spruce up my concept question board for our reading series. I also made new months and other calendar pieces for our math board. Does anyone else use a Cricut to make things for their classroom? 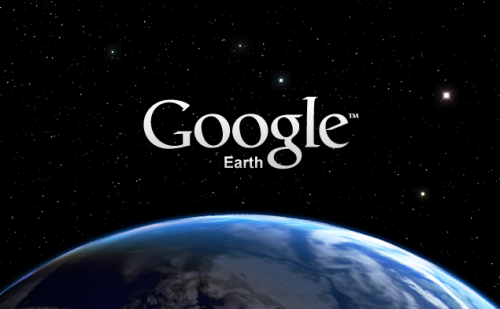 Has anyone used Google Earth in their classroom to create a virtual field trip? I've been reading about teachers that have done this and it sounds really neat. I've downloaded the program onto my computer but I'm having a really hard time understanding it all. My plan is to create a tour about dinosaurs that will go along with our lesson in reading in a couple of months when we talk about Barnum Brown and the discovery of the first T-Rex. Ms. Leslie Ann's Class Wiki: Ho, Ho, Ho! Around here, the annual Alabama/Auburn game is a pretty big deal. It was held the day after Thanksgiving and since we were out of school the whole week of Thanksgiving, we celebrated this day the last day that we were in school. All the kids wore either Alabama or Auburn colors. We divided the desks into two groups and all the Auburn fans sat together and all the Alabama fans sat together (Roll Tide!) We did many fun activities that day and I thought I'd share some with everyone. I have lots of pics from this day on my class wiki, so be sure and check it out! :) The link below will take you directly to the page. During snack, we had a cookie decorating contest. The kids used red/white and orange/blue sprinkles and icing to decorate their cookies. We had 3 winners. Here's the link for pictures. This was the kids favorite activity! My favorite part of the day was the Reading Iron Bowl. A team member from each team was asked questions about skills that we had covered in reading and math. Alabama won 4 to 2. I just wish the real iron bowl had gone that way!! Magic Reading Glasses...They Really Work! If you are a follower of my blog or have read some of my previous post, you'll know how much I love this blog. It's filled with creative ideas and inspiring pictures that are sure to get your creative juices flowing! Check it out..
Best educational Wiki: B-7 Bobcats I don't think I've ever mentioned this wiki on my blog before, but you HAVE to visit it! I found it this past summer and after spending hours looking at all the projects the teacher, Traci Blazosky, has done with her class, I created my wiki. She is beyond talented! In reading this week, we read a story called "The Big Circle". It was about a herd of triceratops protecting their baby from a T-Rex. My kids, especially my little boys, really enjoyed this story and loved learning about dinosaurs. I checked out some nonfiction books from our library and put them in the buddy reading center for the week. We read about T-Rex, Triceratops, and Long Neck dinosaurs, which we learned were also called Ultrasaurus. Here are the dinosaurs we made and displayed the facts we learned on. We have one more story about dinosaurs in the next unit of our reading series called Mr. Bones and it's a biography about Barnum Brown who was a paleontologist. I would love to do some neat projects or activities about paleontologists and more dinosaur activities. Any ideas?? We've been talking about nouns in first grade. To help my kids better understand these naming words, we made a noun board. I did this last year and I would like to do something liked it when we start learning about verbs. They really like doing it and they love showing everyone which nouns they made. As part of our reading series, we complete building background charts with the students. The charts have something to do with the story or topic for the week. It is suppose to build background and allow the students to think about what they already know about the topic. This year I decided to make a bulletin board to showcase these charts so the kids could look back and remember what all they filled out. It has really helped them understand WHY we are doing these charts and they love seeing their work on the wall. I usually have them make something that goes along with the chart. A couple of weeks ago we read a story called Max and Ruby: A Big Fish for Max. We had to fill out a bubble chart about what we would take along if we went on a fishing trip. The kids really got into this, especially my little boys! They made sure they told me EVERYTHING that we would need, right down to fishing wire, scissors to cut it, and a bucket for any fish that we might catch! It really made them stop and think about what they already knew about that subject. Afterwards, I had them make their own fish. I thought they turned out really cute! Here are some new activities that I am going to use in my reading centers. Most of them deal with nonsense words. A friend shared the idea with me and I spent the weekend making them. This one is called "Which witch is which? I downloaded clip art of a witch and typed real words and nonsense words on them. The kids have to sort the witches into the correct haunted house. Here is a close up of the witch. I thought they turned out really cute! The next game is my take on the Sorry! game. There are different boards for different vowel sounds. This one deals with Short A. Two kids can play. The first player picks a card from the stack. Each card has a word written on it. If the word has the short a sound, the player gets to roll the dice and move so many spaces. There are also cards that have Sorry! on them. When a player pulls on of those cards, he or she has to move back spaces (the card says how many). First one to reach the end wins! The last is Nonsense Tic Tac Toe. I haven't used it yet, but a teacher friend says it works really well in her classroom. The child begins by sorting vowels and constants into two piles. The child then picks one vowel and put it in the middle. Then another child puts two constants on a diffferent square and says the nonsense word. 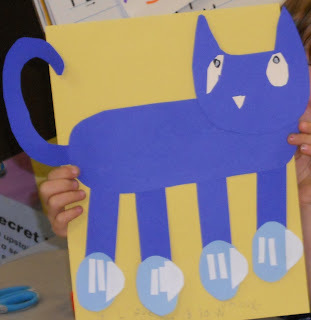 A couple of weeks ago I won the teacher's guide for a picture book called Pete the Cat from April Larremore's Chalktalk blog. This week my class read the book and fell in love with it! They love the song and all day long I heard my kids singing "I love my white shoes". It's definitely a catchy song! Yesterday we decided to recreate the story in a video. The kids had a ball with this! Check it out on my class wiki! The video is on the bottom of the page. I just wanted to share one of my favorite centers that I use in my classroom. I call it 'Story Chatter' and it has worked really well in my classroom this year. It's more of a follow up to my small group reading center that my kids do with me each morning. After I meet with my group for 15 minutes, that group goes to Story Chatter. Here, they talk about the decodable reader that we read in small group. Each week the new comprehension skill is added and they must discuss it. For example, the first week, the group just had to talk about the characters that were in the story since that was the only skill we had discussed. As the weeks go on, they have more to talk about. Right now, each group chats about the characters, setting, if the story was real or fantasy, and the main idea of the story. I listen to the group as they discuss and I am amazed at how well they do at this center. It really helps them practice the comprehension skill and review what we have just read. It also gives me a chance to walk around the room and make sure the other centers are on task before we switch. To see my fabulous first grade class...check out our class wiki!